Interested in winning a copy of Adrienne’s book? Leave a comment in the comment section for a chance to be drawn and win a free copy! Jane Rochford, the scheming and voyeuristic housewife, has made an appearance in almost every novel set in Tudor England. Vile and conniving, it was she alone that brought down those infamous Boleyns. Yet, in the same breath, those Boleyns were no victims themselves. Thomas loved to trade his daughters for royal favor and we know what a lascivious fop George was. Anne was the worst of all – in addition to all of her arrogant scheming, she found time to murder. And above all, no one could be worse than Bloody Mary. The roles seem pretty clear for those that lived in Tudor England. Every Jungian archetype is fulfilled. We have a saint and a sinner; we have a hero and a villain; we have the good and we have the wicked. While these roles may make sense for characterization in any other fictional genre, they have grave consequences for the people represented in historical fiction. Jane, Anne, George and Mary were real people that cannot and should not be contained to these ideals and authors have a responsibility to avoid needlessly tarnishing their reputation. Based on primary sources of the time, it seems very unlikely that Jane had much to do with the fall of George and Anne Boleyn. Very little seems to have come out of her interrogation and we haven’t any contemporary accounts proving that George and Jane’s marriage was anything but happy; at least happy enough for an arranged marriage. The idea that Anne and Jane despised each other seems to be made out of whole cloth. Never once does Anne mention her dislike for her sister-in-law and on at least one occasion, Jane risked her place at court to help Anne rid herself of a competitor for the King’s affection. The greatest misdeed that Jane can be accused of is the aid she provided to Katherine Howard in her clandestine affair with Thomas Culpeper. But in Jane’s defense, it would have been completely against convention to disobey an order from the queen and as we look deeper into the life of Henry’s fifth queen, it is not even certain that the affair was carried out in the way that it has been traditionally described. Katherine herself has often been painted as either a silly naïve girl or an outright wanton. Anne seems to suffer from personality disorder. She is either the vile temptress who lures the king away from his rightful wife and plots the poisoning of his pitiful daughter or she is the heroine of the Reformation, a perfect saint among a pit of sinners. The truth of the matter is far more complex than that. Anne was ambitious, yet patient. She had high moral ideals, yet she could be vain. Anne had her sister banished from court, yet she took great care in the upbringing of her nephew and enjoyed a very close kinship with her brother. We know from contemporary accounts that she had quite a temper and had no problem expressing what was on her mind, but we can also rephrase that description to say that she was emotional and had a tendency to stick her foot in her mouth; both very human traits. George Boleyn was, by all contemporary accounts, a brilliant poet and diplomat. The fact that he rose high so quickly and at such a young age, even before his sister was queen, speaks highly of his capabilities. Records indicate that he was well-liked by his peers and may have even been regarded as an unfortunate victim of his sister’s downfall. The idea that he was a libertine has no basis in fact, yet it seems to be the reputation that follows him the most. George was far from perfect though, he was often arrogant and frivolous with his money. He was known to charm the ladies of the court and his humor was not always appreciated. In Cor Rotto, I tried very hard to stay away from the molds that have formed over the years. There are no heroes or villains. Though Catherine is very kind and pragmatic she can also behave childishly and is often wracked with self-doubt and pity. Francis deals harsh judgment upon those who don’t conform to his moral ideals, but he is a loving husband and father. He is also loyal to his friends even when others would abandon them. In Queen Mary, we see that while deeply flawed and easily manipulated, she can show kindness and mercy. She is not entirely to blame for the horrors carried out under her reign. It is my hope that readers will see the humanity that lies within each one of these complex individuals. Everyday life is certainly different than it was five centuries ago, but the complexity of the human spirit remains. 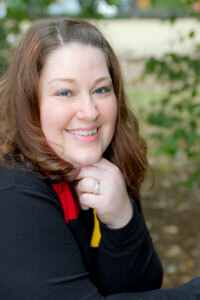 Follow Adrienne as she discusses her book January 19 – January 25! would love to get my hands on a copy. sounds so interesting! 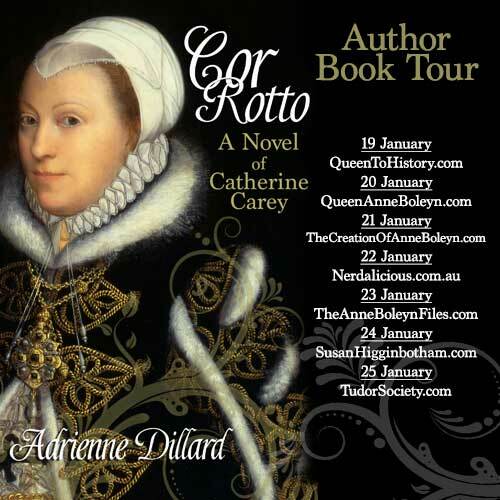 I would love to read Cor Rotto – I don’t know much about Catherine Carey, and I would love to know more about her. Oh this book sounds terrific! I am sooo glad that today’s writers are going to primary sources instead of going by the status quo! What an excellent article, I myself always hate when historical figures (particularly Tudor) are either sanctified or vilified for the author’s own bias purpose. Anne was evangelical and capable of great kindness and patronage, yet she also clung on to conservative Catholic beliefs and could treat her enemies quite cruelly when she chose to. Jane Seymour was meek and submissive in that she knew when to keep quiet, yet she did try and speak out against the King. And whilst she showed great kindness to some, she could have what is considered a chilling indifference to the plight of others who did not matter to her. Anne of Cleves is reputed to have been humble, lucky and clever because she is the wife who escaped Henry whilst making her fortune, yet can she be considered clever when she secretly hoped of being romantically rekindled with the King, or humble when she outright proclaimed her outrage at Henry choosing Catherine Parr over her (coz Anne considered herself prettier than Catherine). Humans are amazing because we are capable of committing acts of kind and equally acts of evil. Most people fall in between this, wanting to be good for humanity’s sake yet always looking out for number one, as selfish as it may be. I would love to read a book that explores this theme in depth about the perceived characteristics of the Tudors and how they differ to the realities. Sounds like an interesting book! I always thought Catherine Carey really resembled Henry VIII in that portrait. Having now looked up the term “cor rotto” I am now looking forward to reading the book! How interesting. Can’t wait to read this book. It’s so good to know that there are no stereotypes in this book. Well done!! Very nice to see a more moderate read of these characters. They have very often been villainized. I can’t wait to read this book! So many times authors make historical figures have traits that serve to propel the plot and it is made easier when there is very little written in the historical record about them. This part of British history is incredibly interesting, and the life of the Tudor is full of intrigue and mystery. I keep reading all sort of information about that time and the historic figures. The books seems to be very interesting and can be really “nourishing” for me as for a history alumni. I’m so looking forward to reading this.It will be very nice to learn something about the Carey family and speculate a little more about this very interesting lady. Can’t wait to read this, not only do we share a name but, I work as a reenactor and play Lady Anne West. That is a pretty cool coincidence! Love it! Sounds great. I always wanted to read more on the Carey children, I hope I can get a chance to read this book. I can honestly say this was a great read. Historical fiction can be so tricky when filling in the blanks of a real person’s life. Great article, Adrienne! I have been keeping up with all of the ‘Cor Rotto’ virtual book tour posts thus far and I have to say I am very excited to read this book! Catherine Carey-Knollys is one of my favorite Elizabethan women, and I am glad that a properly researched historical fiction book has finally been written about her. I think Adrienne makes good points in this article-isn’t it time we reconsider these reputations that we have given Tudor personages that have no basis in fact? Jane Rochford, Katherine Howard, George Boleyn, Anne Boleyn, and more deserve better.